Dear Santa Moff | Warped Factor - Words in the Key of Geek. I have been a very good fan this year. I have bought Big Finish releases, even when they weren’t on sale, and I have read Titan Comics stories and everything. I have not complained once that the REAL Doctor has not being on the screen. I have even watched the Class spin-off, even though everyone said it was mostly poo and it wasn’t, although there was some poo mixed in with the good bits and snogging, so I didn’t like that very much. For Christmas this year, I would like a Doctor Who Christmas Special, please. I would like it if the baddie was not a Robot, because you did that last year and his head came off and he was still laughing and bossing people about, but when I tried pulling my sister’s head off (she is always laughing and bossing me about), my Mummy shouted at me and I had to stay in my room and eat sprouts for tea. I would like it if there was no River Song because she is dead now. Well, she is in my head, so no no no River Song, thank you, to make it feel all Christmassy with her hair and her smile and her catchphrases instead of proper plots and action. Daddy tells me this is call ‘chemistery’ but he is wrong – Chemistery is when Timmy Booger-Face Johnson pours the clear stuff into the white stuff and it goes bang and makes smells and we have to be evackuated because of something called The Counter-Terrorism and Security Act. I got a pamphlet on it and a free trip to the hostpital. My sister has just said that the Peter Capaldi Doctor is always mean to people, but she’s wrong, even if it does look like smiling hurts when he does it and his face goes all weird. Thank you very much. I would also like it if the character of Nardole (or the actor who plays him, which ever is easiest for you to arrange), could be exterminated please. I have seen the teaser clip and there is a big open window in a tall building that the Doctor could push him out of, and that would be cool, because everybody could be like “The Doctor will save him” or, or “The Superhero will save him,” but then they don’t and he goes splat on the pavement like a big Nardole smoothie. That would be excellent if you could do that, thank you. If you could just send me a Christmas Special where there is a big thing to do, and the Doctor is like proper cool, not old man cool, and saves everyone, that would be great. You used to write those all the time for Matt Smith – well, not all the time, cos the one with the Christmas Trees was just I can’t even, but yeah, mostly they were cool. Since Peter Capaldi came in to play the Doctor, my Daddy says you are tired and Out Of Ideas, but I told him to shush, cos he is old and doesn’t understand, and then when Series 9 came on I made him sign a letter saying how wrong he was, and dance around the house pretending he was a Dalek and doing the Wrongness Dance. But at Christmas time he says you fall back on lame stuff and underbaked ideas and he’s said that if this year’s Christmas Special is bad he’ll make ME write a letter, saying how you’re all kinds of Christmas Poo and have Ruined Christmas For EVER. 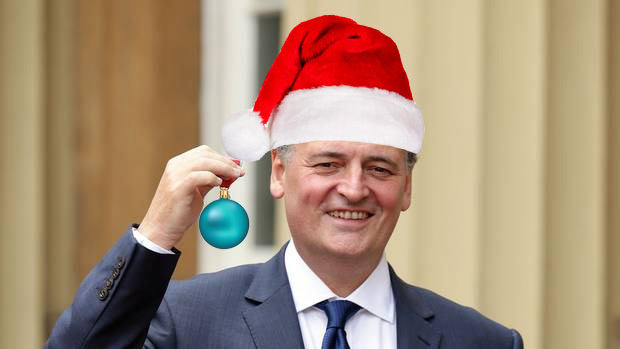 I don’t want to write that letter, Santa Moff, so please come through for me this year. So, anyway, I have written down what I would like in this year’s Christmas Special again, in case you forgot, cos this is a long letter. If you can only fit one of those in, I would like the Nardole Smoothie please, as I could watch that again and again and again and again and again and it would be the BEST SPECIAL EVER! Tony Fyler, aged 45 and a third.